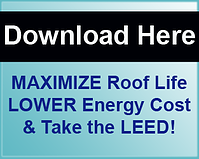 Need a technology-driven commercial roofing system that extends the life of your roof with less roof maintenance? 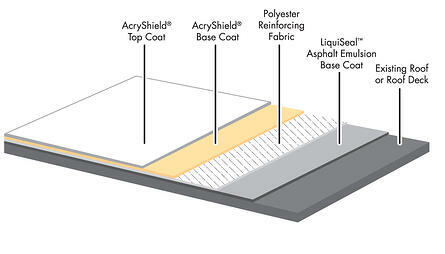 Consider our high performance reinforced, fully-adhered and seamless AcryPly® Commercial Roofing Systems. With these commercial roofing systems you benefit from the latest product and installation advances in water-based coatings that include reinforced asphalt emulsion and Cool Roof elastomerics. You can custom-reinforce your roof restoration for extra toughness under adverse service conditions, and you benefit from long-term warranty options and the added confidence of using qualified professional applicators. Durable weatherproofing. Much more resistant than traditional roofing to general chemical attack from precipitation and vent emissions. 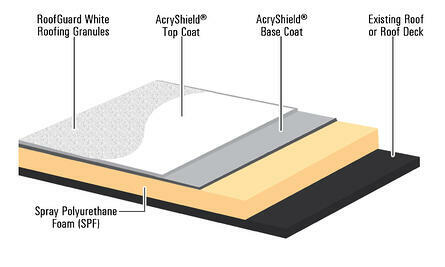 Often applied over existing roofs without costly tear-off and landfill waste. No dangerous temperatures, hot asphalt or torches -- Only environmentally-friendly water-based systems. Crews achieve much higher productivity. Reflectivity up to three times greater than dark BUR, EPDM, and ModBit roofing, means large energy savings and less roof maintenance for fast paybacks on roof investments. Can be applied to the broadest range of substrates including BUR, Modified Bitumen, EPDM, PVC, TPO, Hypalon, Metal and Transite. Very adaptable for high-rise buildings.